I always vow to make it to Park Bruges more often and fail. We went a few weeks ago and before that we had last dined there in early July 2016. So 9 months ago. They still have delicious Earl Grey iced tea. They had an East End beer SP had not yet tried and really liked. But they changed the Tarte Flambée! 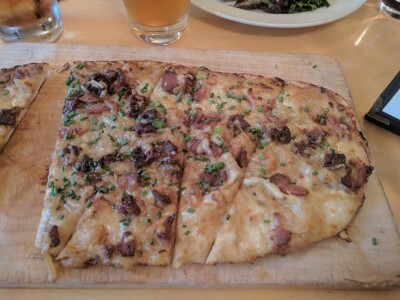 We always start by sharing Tarte Flambée, from the Alsace region of France, a thin crispy crust with a variety of toppings. This time the toppings were Emmenthal, bacon, crème fraiche, caramelized onions. It was good but not as good as the rosemary ham, caramelized onion, chive, shaved cheese one they used to offer. 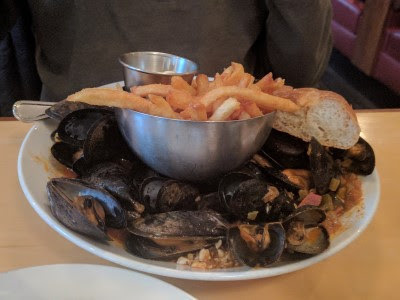 SP chose Moules Frites, the Spicy Creole version (andouille sausage, peppers, onions, celery, bleu cheese). He got it without blue cheese since he dislikes it. As always, he enjoyed his mussels. I really, really miss the Sauteed Chicken Breast with onions, tomatoes, artichokes, mushrooms, herb risotto, marsala sauce. 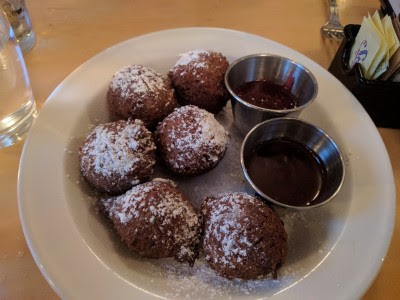 I ordered it every time and it was soooo delicious. 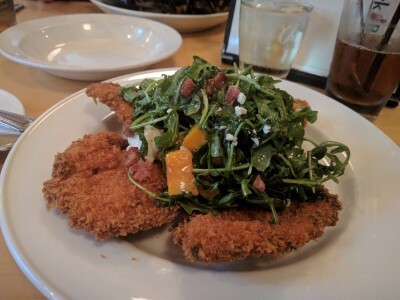 Last summer I discovered it was replaced by Chicken Milanese (lemon-basil panko breading, arugula, peaches, pancetta, goat cheese, red onion, heirloom tomatoes, honey bourbon vinaigrette) and now the Chicken Milanese is served without peaches & tomato but with butternut squash and with a citrus herb panko breading. The breaded chicken is still delicious, but I miss the other salad. I realize it's likely a seasonal thing, but I'm still sad. 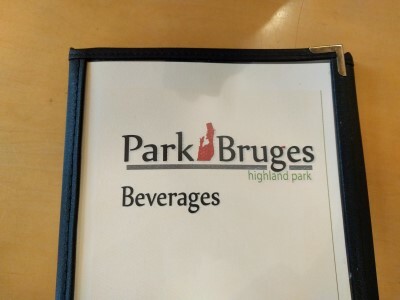 I still like Park Bruges a lot, I just miss the dishes I used to always order. Sometimes change stinks!